The Great Smoky Mountains National Park is the busiest park in the US, and Cades Cove can seem like you are in the worst of New York and Toronto commuter traffic. So why on earth would you want to spend a perfectly good weekend stuck in traffic? Simple, once you look beyond the bumpers ahead of you, the rewards quickly become apparent. 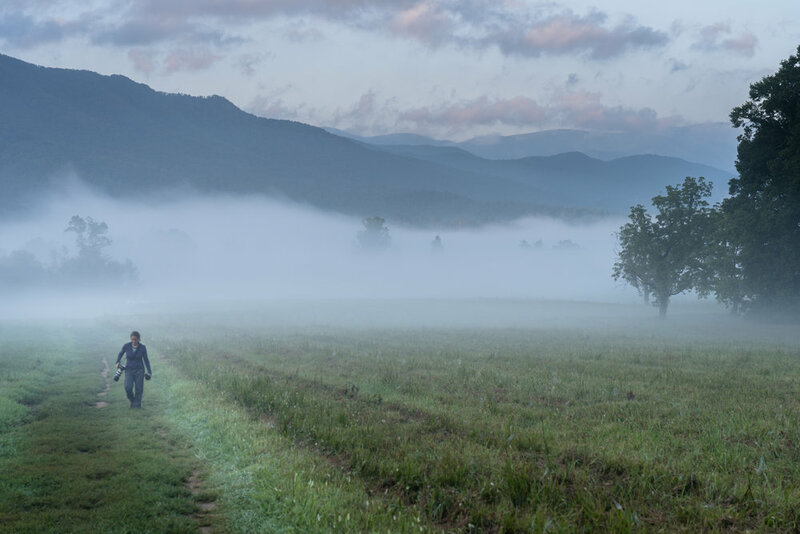 Salwa (WanderingPhocus.com) looking for a good spot to capture the morning mist across the valley in Cades Cove. Over the last 4 years we have done day trips, weekend getaways, and week-long camping trips into this small corner of the crowded park. We finally found the right combination to get the place mostly to ourselves to experience the exceptional sunrises, have a picnic overlooking the distant mountains, and shoot both landscape and wildlife photographs in spite of the occasional selfie-taking tourists wandering into the picture, placing themselves dangerously close to the resident black bears. Standing cub looking to ensure mom isn’t too far away. Bears, that’s exactly what the majority of people come in to Cades Cove for. Fortunately for everyone, the park rangers have managed to ensure that the bears don’t see people as a source of food and enforce a strict standard for food storage at the campground. While the bears are tolerant of the people, we’ve seen plenty of occasions that would irritate even the most docile animals - including encroaching on their space and blocking their escape routes, cornering them in trees, or our favourite, approaching them with cell-phones extended and a complete disregard to their or the bear’s safety. Sow and cub looking up from eating the new grass shoots in early spring. The best time for shooting bears is in the Spring when they venture out of the woods to eat the new shoots of grass after a winter of foraging acorns. Mother bears with new born cubs amble along the edge of the fields, keeping a close eye for potential danger (usually from the irritable males), keeping their cubs close by and close to climbing trees. Year-old cubs eat along side mom until they get bored and start sparring and testing the limits of their mom’s patience. cubs are just as comfortable in the trees as on the ground. This is the first place to head at any sign of trouble. Finding the bears takes some patience, knowledge of their habits and luck. Having said that, the easiest tell-tale sign of a bear spotting are the “bear” jams - a snarled and snaking line of stopped vehicles that can stretch back for miles. Trying to drive to the sighting is usually an exercise in futility and frustration since some drivers refuse to pull over. Instead, they stop their vehicles in the middle of the road, swing their doors open, and race toward the bears with complete disregard to everyone else - cue the car horns. While the cars are backed up, I typically grab the cameras and walk past the traffic jam to get some shots. This is usually worth the effort since the bears are often only about 50 to 100 yards off in the field. With a long lens, and a bit of patience you can get some fun shots even with a line of cars and people in the background. Pair of cubs keeping an eye on the crowd of tourists on the road. To get the best shots, however, you need to find the bears before the crowds find them, and this means knowing some of the locations that the bears frequent, the trees they like to climb and sleep in, and where they find security and slip off to when a crowd encroaches. A good set of binoculars helps too and you can often see the bears at the edge of the tree line and anticipate if they are going to come to a good shooting location. In these cases you will most likely get some of the more interesting shots before people catch on to what you are looking at with that big lens. Bears are not the only wildlife you’ll encounter at Cades Cove. We’ve spotted deer, coyote, river otter and a variety of birds there. Pair of bucks doing a little sparring in early fall as the rut starts. When the crowds get a little much and the animals have retreated from the midday heat of the sun you can get out on some of the hikes that are along the edges of the cove. One in particular has a spectacular waterfall at the end of a fantastic walk along Abrams creek. Don’t be surprised if you see a black bear wandering along the creek as you make your way up and down the trail. Abrams falls is the reward for a long hike up and down a couple of mountain ridges. Great place to sit and relax before tackling the walk back out to the cove. Much like shooting Elk in Cataloochee, the gear I take consists of the Canon 5DS with the 500 f4 and both 1.4x and 2x teleconverters usually on a tripod with the Jobu gimbal head. I carry a second camera with a 100-400mm lens, in this case either the Sony A7III for faster action or the Sony A7RII for high detail shots. In the morning, I will usually have a landscape lens on the A7RII. Often the first hour in the cove you will find spectacular light and misty views around every corner. From the perspective of being ready for the shot, I always try to keep a camera ready for action in fairly low light. Since the fun with bears usually happens close to the edge of the forest, light is unpredictable and animals move in and out of deep shadows quickly. I will usually keep one camera set to a minimum of ISO 1600 at the largest aperture of the lens (in aperture mode) and watch the shutter speed range from shadows to the brighter areas. I try to keep to a 1/1000s in the shadows when possible. I have found it is almost always better to have a bit more noise and get the shot without any blur. If you have never shot black bears in low light it is good to know that single point autofocus can be fooled since there is very little deltas in contrast for the cameras to detect. I will tend to use wide area focus on the Sony and then drop down to smaller groups if the bear is behind leaves or high grass. The canon is usually good with 9 point focus as at least one of those points can find the edge of the bear’s fur. For the most interesting shots, anticipating some actions can lead to great shots. Young bears will often wander a little ways from mom while chewing on grass in the fields. Once they realize this they will often stand and look around giving some really fun shots. If you see another bear in sight of a mom and cubs, be ready to watch mom give a grunt signal to climb. Shots of the cubs climbing trees and sitting on the limbs are some of the best you can get. Young cub waiting for mom to give the ok to come back down out of the tree. Pick your season: The first couple of trips we made the mistake of visiting on a beautiful weekend in the summer. We quickly caught on that spring is the most interesting times of year and that’s when the bears typically come out of the woods to graze in the open fields. Late Fall can be fantastic as well as the deer are in rut and the bears are busy eating all they can before winter. Pick your day: A weekday is best if you can. Sunrise is the best time to photograph in Cades Cove. Choose a day that has a chance of rain in the forecast which typically clears out the park and gives you an opportunity to take some moody landscape shots in the morning fog. 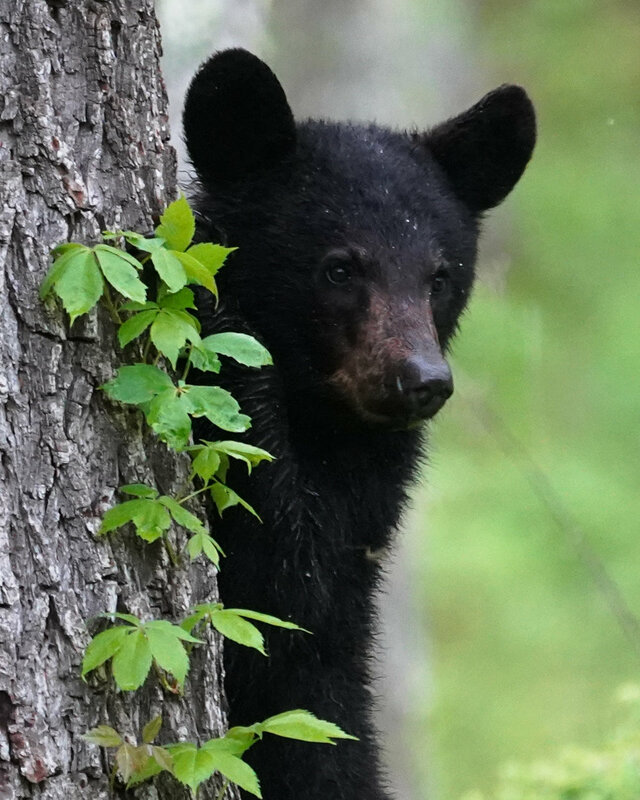 Carry binoculars and scan the edge of the woods for the tell-tale shape of black bears. Take the longest lens you have or rent one. A Sigma or Tamron 150-600 on a crop body can give you enough reach that you won’t disturb the bears and won’t completely destroy your wallet. If you get to Cades Cove at the right time of year you can have portions of the park all to yourself, at least for a few moments. Once you have found the magic times to wander Cades Cove, each trip has the potential for some amazing experiences and views. Whether it is bear cubs climbing a tree, deer sparring in the fields or magical landscapes at sunrise we have yet to come home without something to add to the portfolio. Even if you get there and it is busy there is always someplace to go to get away from the crowds.